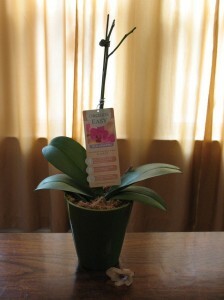 An orchid’s success is as easy as A-B-C! Always wait until the bark or moss is almost completely dry before watering. Be sure to keep you Orchid out of direct sunlight. My immediate thought was, “How can these people stand to write something that so blatantly disregards the rules of parallelism?!? The ‘C’ needs to begin with an action word, not a noun!” This was particularly troubling because they could have gone with “Care for your orchids with confidence and you’ll be successful!” Really, it was just a little disappointing. Also, they offered additional directions on the flip side of the tag. Which, I thought, didn’t bode well. I mean, if they were so easy, why did they need a flip side with small-print directions? I followed all directions precisely, yet the blooms fell, one by one. I guess, in retrospect, I didn’t follow C. But surely I couldn’t have killed my plant by my own lack of confidence. . . right? The last flower has fallen to the tabletop. So when my friend came over, I basically had a stick in a pot. With a big tag announcing how easy it was to grow my dead plant. On the bright side, the pot itself is lovely, and it matches my living room to perfection. 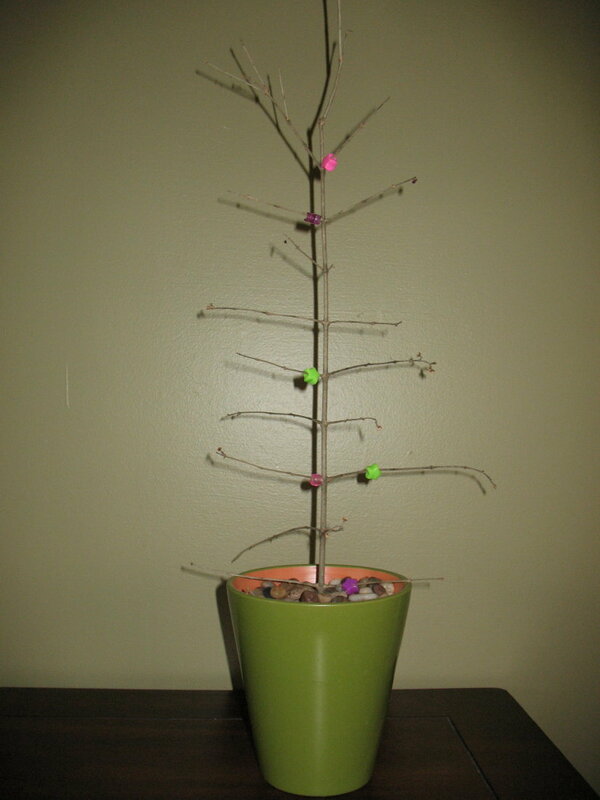 Today J showed me a delightful craft that she’d made by putting plastic beads on a branch. But she needed some way to display it. Luckily I had a lovely plot, and, thanks to the rice-and-paper whites fiasco, I’ve got cute little ornamental stones. Ta da! I offered to help J find more beads, but she was adamant that it already expressed her Artistic Vision. *I thought about this later and realized “always-way-more-thoughtful-than-me” was not a very helpful description for those of you who might want to know which sister it was. Because, truly, there is a high standard set in my family, and I frequently fail to attain it. Anyhoo, I meant M.
While my foray into orchid growing was about as unsuccessful as yours, do not despair. The flowers are supposed to fall off eventually and then it goes into a “dormant” phase. At some point, (I think this is where I screwed it up), you cut back the “stick” and after another long while, it starts growing again. But after a year I got tired of waiting for something to happen and threw it away. Good luck! Whoops. . . so I shouldn’t have ripped it all out and thrown it into the garbage. . . ? Uh, oops indeed. Sorry for chuckling at your plant — it was more of a “THANK GOODNESS I’m not the only one who kills orchids.” Now I’m just crying into my non-existent chai at my stupidity. Oh, puh-leeze. It was pathetic. And I’d just left it there, because last I’d seen it still had that one little flower. So very sad. I won’t cry if you won’t!